Title: Populus North of the Brooks Range: Temporary Adventives, or Yet Another Sign of Global Warming? Populus L. is rare north of the Brooks Range in Alaska. Populus balsamifera L. (balsam poplar) is noted from a few refugia and Populus tremuloides Michx. (quaking aspen) is not reported at all. The current observations, however, find them both to be fairly common in disturbed areas such as roadsides and old gravel diggings. This may represent northward spread of these species due to climate change, or merely temporary survival after accidental introduction. These first observations are presented as a baseline, to allow determining this in future years. The word “tundra” means “treeless”, and that is the character of Alaska’s North Slope, from the Brooks Range to the Arctic Ocean. In this open country, trees stand out. People have noted the few stands of Populus balsamifera L. (balsam poplar). One grove is at Ivishak Hot Spring, where geothermal warmth creates a microclimate equivalent to much further south. Scattered populations of P. balsamifera are known from along major rivers, where flowing water evidently contributes to warming the soil. One locally known site is a very steep south-facing slope in a sheltered hollow. The limiting factor is evidently permafrost depth. Tundra soils are typically frozen most of the year, with only the surface thawing in summer. The permanently frozen subsoil, which extends to great depth, prevents penetration by tree roots. The common factor in all previously observed P. balsamifera stands appears to be that the soil thaws to greater depth than typical for the North Slope tundra. Populus tremuloides Michx. (quaking aspen) is the tree with the greatest range in North America, being found in all of the 50 United States. Yet the range maps in both Flora of Alaska and of NRCS indicate it is not present north of the Brooks Range at all. This observer, therefore, thought it was remarkable when he began finding both of these species near Tookik Field Station (TFS). Toolik is the site of many ecological surveys, with exhaustive documentation of all natural phenomena. Yet Toolik botanists were evidently unaware these two species existed in the vicinity. These observations were undertaken during a brief stint at TFS, 26 August to 7 September 2011. The overall plan was to record parameters on each individual of Populus seen. The goal was to choose parameters that will readily show changes in health, biomass and/or abundance in future years. The parameters chosen were GPS location, height, age, and number of clonal stems. In addition, digital photographs were taken, though these may be of limited usefulness as hard data. GPS locations were recorded using a hand-held Garmin GPSmap 60CSx. Positional accuracy was typically good to 2 to 3 meters. Locations were recorded as waypoints. Individuals of Populus were scattered, so there was seldom any ambiguity as to which waypoint corresponded to which individual. The datum was WGS 84. Waypoint coordinates included both decimal degrees and UTM. Waypoint timestamps were automatically recorded in Pacific Daylight Time (default time zone for the device). Where coordinates are given in this document with no other explanation (for example: 68.03210853, -149.67015512) the first number is latitude and the second is longitude, both in decimal degrees. Positive latitude means north of the equator and negative longitude means west of Greenwich meridian. The datum is WGS 84. Heights of individuals were measured using a folding 2-meter tape, and are given in centimeters, to the nearest centimeter. The number recorded is the maximum height of any stem from terminal bud tip, measured straight down to solid ground surface. Seldom was there sufficient slope that the “tallest” stem by these criteria was in question. Much of the local tundra is spongy, so “solid ground surface” could be indefinite; but all Populus were on sites having a hard substrate covered by no more than a litter of fallen leaves. Both observed species of Populus have a marked tendency to send up adventitious stems from their spreading roots, and thus to become clonal colonies. In only one case was there any possible ambiguity as to which aggregation of stem represented a clone. In this case, two clumps were near each other, not much more distant than the size of the clumps. In all other cases, clumps were widely separated. At the observation time, deciduous tundra species were in the process of normal autumn senescence, their leaves turning yellow and gold. The different Populus clumps varied in shade of leaf color and timing of leaf fall, providing another means of distinguishing the various clones from each other, and from Salix (willows). In the data record, each Populus clone is considered one individual. In the single ambiguous case, the two clumps are recorded as separate individuals. Individuals are coded using the standardized NRCS species codes, followed by an underscore and a three-digit numerical identifier. The numbers are the order in which the individuals were found, 001 being the first. The NRCS code for P. balsamifera is POBA2, so the code for the first individual found of that species is POBA2_001. The species code for P. tremuloides is POTR5, so the first found individual of that species is POTR5_001. In recording stems per clump, stems were counted as distinct if they had at least 1 cm of space between them at ground surface. This arbitrary criterion might possibly yield some confounding counts in future years, if stem bases widen to have less than this distance between. In most cases, however, stems were either well distinct, or closely aggregated. Clones that produced aggregated sprouts appeared to be rapidly proliferating. If such clones remain as healthy in future years, the stem count will increase to indicate this, even if there is some uncertainty in the number or stems. Some stems were very short, but they were counted if they had even one recognizable leaf or bud. P. tremuloides is easily recognized. The leaves have a distinctive shape range, from cordate to broadly lanceolate, often wider than long. The laterally flattened petiole, which causes the leaf to “quake”, is also diagnostic. P. balsamifera would not be confused with P. tremuloides but possibly with some of the shrubby Salix (willows). All had yellow leaves (at the observation time), and some Salix leaves were similar in shape to P. balsamifera. However P. balsamifera stems have a distinctive upright growth habit with a central leader, while all local Salix are spreading. After eye training to develop a search image, P. balsamifera was easy to spot. An unambiguous diagnostic was the axillary buds. In P. balsamifera these have a large, pointed, enwrapping scale with a shorter truncate scale distal to (“in front of”) the large scale. Salix have a single sack-like bud scale. Axillary bud of P. balsamifera, showing bud scale structure common to all species in the genus Populus. This unambiguously distinguishes them from Salix (willows). All putative Populus individuals were checked for these diagnostic characteristics. Age of Populus individuals was estimated by counting bud scale scar rings. This is a non-destructive technique useful for estimating growth years of woody species where the plant can be observed all the way to the top. Bud scales are modified leaves. When they fall off after bud break, scars remain on the stem similar to those left by the bases of petioles of regular leaves. 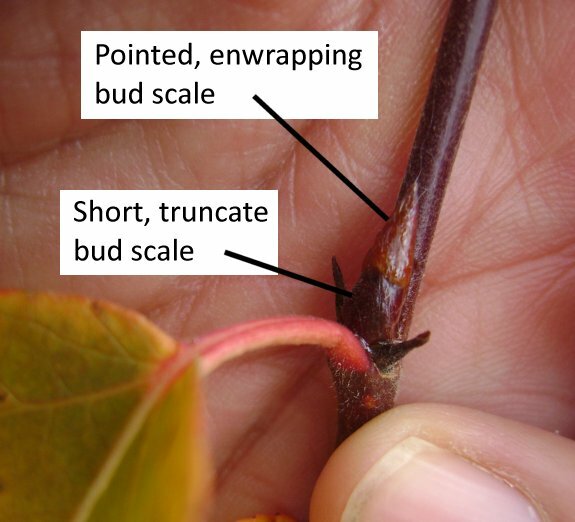 Since the bud scales are in close proximity to each other, their scars form a visually identifiable “ring” around the twig where the terminal bud was that winter. As the stem elongates out of the bud during the season’s growth, the first leaves are close to the bud scale ring, and close to each other. As growth continues, the leaf bases become spaced further apart, up to a typical maximum. As stem growth slows in anticipation of dormancy the leaf positions again become closer together. When the terminal bud forms, the bud scales have no stem extension between them, and so their bases form another ring. Ring of bud scale scars on P. balsamifera stem, indicating sections that developed during two succeeding growing seasons. A few bud scales persist. It is thus possible to read back along a stem and count the previous seasons of growth. The pattern of leaf/scale scars becoming more distant from each other and then close together again defines a year of growth. It is usually possible to read back at least 5 years at high confidence, often more. Deciduous trees can perform two or more cycles of bud break and growth in a single year. This is rare, and usually due to extremely favorable growing conditions, unlikely in the arctic. As woody stems become older, the bark thickens, stretches, and cracks. This finally obscures the leaf/scale scars. Many deciduous trees have the ability to persist as stunted seedlings for years, then grow rapidly when conditions improve. Coupled with bark roughening at the stem base, this could hide many years of a tree’s age. If a stem is broken off, growth resumes from a lateral bud. 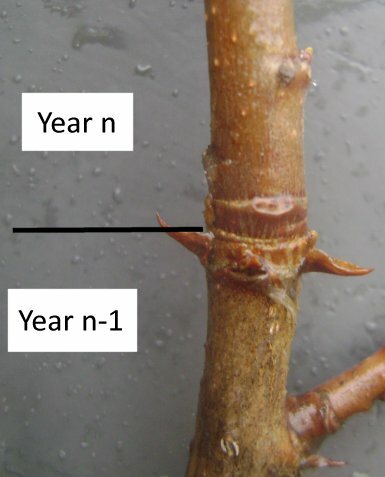 All the growth information above the break is lost, though the remaining stub above the activated lateral bud indicates at least one year’s growth, and the change in branch angle is evident. The Populus stems observed had many partially missing tops like this, probably due to winter storm damage. Similarly, aboveground stems may be completely removed by browsing, disease, or winter kill. If the roots re-sprout, as Populus easily do, scar rings can only count the years since this occurred. In a few cases the remains of dead stems indicated the clone was older than the oldest living stem observed. Usually, though, the group appeared too young for this to be so. A “GPS track” was recorded while searching for individuals. This is a semi-standard technique used in rare plant surveys. The GPS receiver is set to internally record a position periodically by time interval, by distance interval, or by an “auto” algorithm combining both time and distance. The “auto” setting was used. This track provides a series of locations that define a search path. Since recording is automatic, it does not distract from the search. Each track location is timestamped. This allows geo-referencing of the digital photographs by matching the photo file creation timestamp to the nearest track point timestamp. Timestamping also verifies observation date and time. The track can later be displayed on a map to show the path searched. It can reasonably be assumed that any individuals of interest within a certain proximity to the search path would have been seen, the proximity depending on terrain. In the open North Slope tundra, this proximity would be at least ten meters either side of the search path. By this means confirmation of absence can be established for an area. Categories: long posts, science | Tags: Alaska, botany, environment | Permalink.